With the fame that was spawned by the Grumpy Cat internet phenomenon, it was only a matter of time before the canine equivalent was found and introduced to the world. 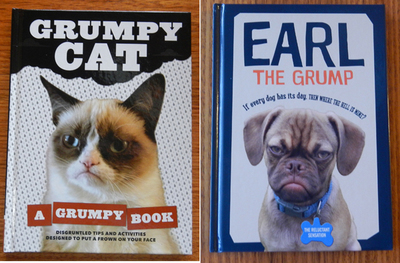 Hence, we have Earl The Grump- a frowning-faced, half-pug/ half-beagle rival to the cat that started it all. Although his internet presence isn’t quite as great, Earl has over thirty-four-thousand followers on Instagram (at time of writing), and has also recently had a book released. 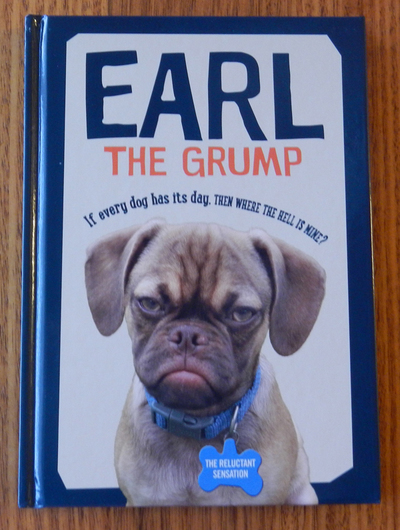 Earl The Grump is basically a book that is full of images of the grumpy-faced creature- each with a sarcastic phrase attached. Most likely taken straight from the internet, these memes (captioned photos that spread virally across the internet and are often humorous in nature) emphasise the grumpiness of Earl, and are very similar to those that can be found in Grumpy Cat: A Grumpy Book. Interspersed within these memes are extra tidbits, including misguided emails to the Cat Protection Society, poems, and lists of Earl’s likes and dislikes. 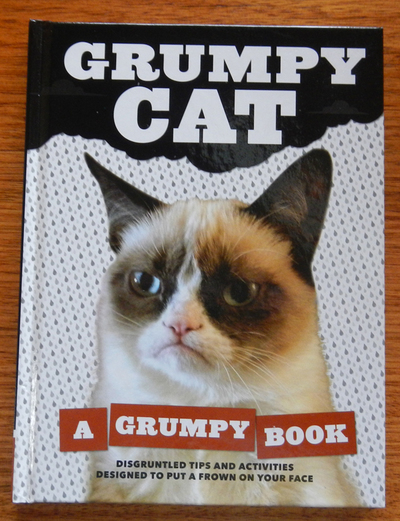 Likewise, Grumpy Cat: A Grumpy Book features many images of Grumpy Cat in front of a grey background, with the trademark sarcastic captioning. The main difference however, is that this book seems to be more interactive for its readers, also providing mazes, puzzles, quizzes and other activities for them to complete. Both books strongly emphasise the ‘grumpy’ natures of their leading stars, and highlight the canine versus feline rivalry. They also seem to have been put hastily together- using snippets taken mostly from online. Perhaps this was to capitalise on the sudden popularity of the animals and make the most of these often-fleeting internet fads. Whatever the case, it means that there isn’t much new material within the books and followers of the animals online will likely have seen the memes and/or other bits and pieces within these pages before. Fans of these animals will probably enjoy seeing them in hardcopy, but then again, if you aren’t a fan of them, I don’t know why you’d bother even picking up the books. All I know is that the owners of these animals are probably very happy with the financial outcomes that their pets have provided for them- it seems that grumpiness can pay off!